A boy who is 9 years old or is in the third grade is a Bear, and his adventures are found in the Bear Handbook. Like all other new Cub Scouts, a Bear must first earn his Bobcat rank. After completing the requirements for Bobcat he may go on to complete the requirements for the Wolf rank and the many electives that are offered for his rank. For boys who are in third grade and/or are 9 years old. For each adventure, the Bear Scout must complete the requirements as outlined in the Bear Cub Scout Handbook. Requirement 7 of Bobcat and requirement 3 of Bear are identical. 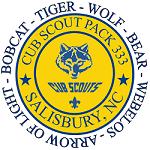 If a Cub Scout earns his Bobcat rank during the same year that he begins working on his Bear rank, he needs to complete the requirement only one time. camping, you may substitute a family campout or a daylong outdoor activity with your den or pack. 4. Make a list of equipment that the group should bring along in addition to each Scout’s personal gear. actual weather at the same time every day for seven days. puts into practice your ideals of duty to God and strengthens your fellowship with others. of worship or spiritual community. Select two of the items, and practice them for two weeks. plants are living nearby the place where you choose to hike. endangered. Explain what caused their declines. area, wildlife rescue group, or fish hatchery. Describe what you learned during your visit. well, what could be done better, and how everyone worked together to make the event a success. a. Visit a local sheriff’s office or police station, or talk with a law enforcement officer visiting your den. During the visit, take turns with your den members asking questions that will help you learn how to stay safe. Your family can determine the emergency, or you can develop several plans.